Discover how my simple software can quickly and easily rocket your website to the top of any search engine you want in just 2 weeks! I just wanted to thank you. After using RankLocator for two weeks I was able to promote my web site ClickLocker.com to position #2 on Google for the keyword phrase "pirated software." With 45,202 searches per month, that means a lot of free, targeted traffic for me...and therefore a lot of sales. With RankLocator, top rankings for popular keywords on popular search engines are finally a reality. I now run RankLocator every morning before everything else to check on my search engine rankings. It's amazing what a little bit of tweaking can do when combined with RankLocator's reporting features. I'm not sure why you decided to release this tool to the public, but I for one can say that I'm glad you did. Congratulations on such a wonderful tool Dale, and I wish you the best of success! We've all had the same problem. When I started my website 3 years ago, I tried all I could do to promote my website to the top of search engines, because I knew search engine traffic was the most reliable, consistent, and free traffic out there. I spent a lot of money to hire search engine optimization experts for help. I tried purchasing $67 e-books on the topic. I even attended a seminar that cost me over $1,000. I was so excited and the first thing I did every morning when I woke up was check if my web site appeared on the first few pages of the search results. However, I found myself more and more disappointed each time. Six months passed and my website never showed up anywhere near the top of the results on any search engine. Needless to say, I was frustrated. How did they do it? How did the people who were #1 ever get there? We all know that they get thousands of hits each day for FREE, so just imagine the sales they make! They got there somehow, and I was determined to find out how. So I called one of my good friends who had at lot of search engine promotion experience to help me and to make a long story short, he told me all the same things I'd heard already. Sure, his sites were doing fine. But where were mine? I didn't even know. Finally one day I was lying in bed late at night, completely frustrated, and I tried to think of something I could do about this. I didn't want to do anything impossible, I just wanted to get myself a good ranking on the search engines - something that plenty of other people seemed to be doing just fine. Suddenly, a simple idea shot into my head, and my heart started racing. I jumped out of bed even though it was 4:00 AM and I ran to my computer. I spent a few hours searching on Google and Yahoo but I couldn't find anything even remotely close to it that had already been done. I was so excited, I called my friend immediately and woke him up. He was pretty angry that I called him that early, but once he heard my idea he was speechless for about 30 seconds then he told me that he hadn't heard of anything like it before but that he was sure it would help just about anyone get a #1 ranking faster than ever before. The best 80 bucks I've spent this year!!!! Dale I got your program this afternoon. After following the simple advice in the e-book and adjusting a few key things on my website, I went from #33 under the competitive phrase 'sales training' to position #4 on Google in just under 20 minutes!!! Google must have indexed my site just after making the change! I am astounded, to say the least. Pay-per-click services charge close to 5 bucks per click for that word -- now I've got a flood of traffic and have made an additional 3 sales in less than 8 hours -- and it hasn't cost me a dime! Not only that, I'm #4 out of more than 3 1/2 million sites! Thanks, Dale, for a phenomenal, easy-to-use program. - Len Foley, author of the best-selling book: Sales Without the Sucker Punch! P.S. I just checked... I'm also ranked #1 on Lycos under the search term "sales coaching"
Before I tell you about my idea let me describe the basic flaw in search engine optimization that it solves. Unless your web site is already on the first few pages of the search engine results, how do you know what effect your promotions are having? If you're on page 96 of Google and page 82 of Yahoo, how do you expect to jump to position #1 without going through positions 95, 94, 93, 92, etc. first? Before you can do that you will need a way to monitor exactly where your pages are, for multiple keywords and multiple search engines. Only after you can get instant, detailed reports of your progress can you move your site to position #1. Without knowing this important information there is no way you can find out whether the method you are using for tuning your website is effective or not, since the strategy you are using could be having no effect on moving your website position or it could even be moving your web page down in ranking. It's not possible to simply take canned advice from someone else and apply it to your site. Your site is unique, so only some of what people say will apply to you. Using RankLocator, you can make small changes and watch instantly as your ranking moves up and down. After a few tweaks, you'll know exactly what you have to do to move your site to the top. I'm absolutely thrilled that I have RankLocator - AT ANY PRICE! I have just started my website called Smart Classifieds: By gathering tips from your email newsletters, from other sources including some great advice from my web host and IMHO; without resorting to 'short-cuts or artificial' ~smart-pages or cloakers~. They do seem to work fine but in most respects are artificial and one day the powers that be at search engines may ban them AND the sites that use them, so, why take the risk? Especially when RankLocator, and the tips you have provide do it the Smart Way! The top secret search engine weapon that I've been using for years is finally being released to the public! My name is Dale Woodland. I developed RankLocator first for myself so that I could promote my own pages. Ever since, I've been quietly playing the Internet field, making a living by bringing my pages and my clients' pages to top positions on the search engines. If you haven't heard of me yet, that's probably because I haven't decided to make myself known to the marketing community until now. About 2 years ago, after I started using this tool that I developed, I effectively moved my websites to the top of the search engine in only 2 weeks. Then, I sold this tool to some larger web sites who'd been struggling with their search engine rankings, and only couple weeks later I found their WebPages move to the top of search engine results as well. In my opinion, it is absolutely ridiculous that this important tool hasn't been available to the public until now. Word on the street has it that many of the larger search engine optimization firms have private, internal tools that perform the same functions as RankLocator, but I'm not necessarily supposed to release any details about that. I do know, however, that I've been using it for a long time now with some pretty spectacular results. What RankLocator does, in short, is generate detailed ranking reports of exactly where your web pages are in all the major search engines for a list of keywords that you provide. In addition, you can compare yourself to your competition and find out what you need to do to move your site to the top. Once you know exactly where your site is on the search engines, you can watch what each and every small change you make to your web site does to your ranking. Pretty quickly, you'll find out what you need to do to move your site up to the top. I've included as a free bonus for a limited time when you order RankLocator an excellent e-book on search engine optimization. Just read what the book says, apply it to your web site, and watch RankLocator as your ranking goes up. Since only some advice will be good for your web site, you'll be able to sort out what you need to do in no time. Above is a screen shot from RankLocator. I've placed this screenshot here so that you can see how streamlined and easy to use its interface is. I'm sick of all those complicated programs out there, so when I designed this application I made it really, really simple. You enter your web site URLs, keywords, and select a search engine on the top, and then you hit 'Search Now.' A few seconds later, a detailed report in table format is shown on the bottom, ready for you to use to tune your web site's rank. It couldn't be simpler! Your product is user friendly. I happened to raise my website http://www.topkatt.com/walmart-dvdrental.html from n/a to #3 out of 5,500,000 on Google search engine, and #3 on Yahoo out of 5,280,000! Wow, I did it in a day and a half. My timing happened to be right. The next day another web site is number 2 out of 5,500,000 and 5,280,000. Therefore the top 2 and 3 are my websites. My Hits increased 500%. Thank You so much!!!! Walmart-Try Free First! Unlimited Online DVD Rental! Quick and easy to use so you don't have to waste your time learning how to use it. You can generate a ranking report for multiple keywords so you can monitor and raise your ranking on the search engines for multiple keywords, ensuring that no matter what your potential customers search for they will find you. You can generate a ranking report for multiple URLs so you compare yourself with your competition daily and compare your own sites with each other as well. Save your history so you can have your rank always at your fingertips and easily check the progress you made daily. Supports all the major search engines so you can work on getting to the top of all of them at once. Free, easy and instant upgrades - we're constantly adding the code that supports more search engines and the updates will be downloaded and intertraded to your software automatically when you run your program so you can access newly supported search engines instantly. Free support. If you have any problems or questions with the software I will personally help you solve your problem quickly via email. It works on all versions of Windows operating systems so you don't have to worry about any compatibility issues. It is simple and there are no distractions so you can just run the program and get the report as soon as possible. Instant download so you can run RankLocator the second you purchase it. Ten minutes ago I purchased RankLocator. Four minutes later I discovered my site is listed #65 in Google under the keyword phrase "resale rights." Quite a surprise! - I who have, for the past three years, largely ignored s/e rankings as an exclusive venue dominated by the big girls and boys. If my site can rank #65 by default, imagine what it can do with a bit of tweaking. I think your RankLocator has just become one of my most important marketing tools. As you can see, RankLocator is one of the most powerful search engine optimization tools available on the net, and at the same time it is one of the quickest and easiest to use. A copy of Search Engine Guru Chuck McCullough's Search Engine Primer. This E-Book is power-packed with some of the best search engine advice I've ever seen. You get it all free when you order RankLocator. Follow the advice in this e-book, and track your progress with RankLocator, and you're practically guaranteed a top ranking! 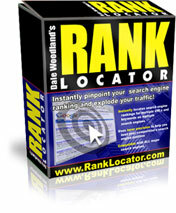 RankLocator is the only tool tracking your website position available for sale on the Internet. Over $1,500 of research and programming went into designing the software, and in the past I sold it as a custom solution to several major web sites for over $5,000. Those companies in turn made that back many times over with their top rankings. After my friend and I discussed it for a long time, we originally decided to sell this software for $249.00. At the last minute before releasing it, however, I spontaneously decided to sell it for only $79.95. The reason is simple: I would like to help other people like you, so you don't have to repeat the same mistakes I made three years ago. And in addition, as long as I don't tell you what keywords and what web pages I am promoting, you won't be competition to me. RankLocator comes with a 100% money back no-questions-asked guarantee. I know for a fact that just within seconds after downloading RankLocator you will be absolutely astounded at how easy it is to pinpoint your search engine ranking. However, I'd still like to make sure you feel safe making this purchase, so if at any time within 30 days, if you find out that RankLocator isn't living up to your highest expectations, just drop me an email personally at dale@ranklocator.com and I'll refund 100% of your money, no questions asked. I'll even let you keep the bonuses I mentioned above as a way of thanking you for your time. If you want to get your web site on top of the search engines and start getting the most reliable, FREE, and powerful traffic there is out there, it's best to start as soon as possible. With RankLocator, this can finally be a reality for you. So, you know what to do...click the button below, take out your credit card, and order today. In a matter of minutes you'll be on your way to a top search engine ranking! Product will be available for instant download. P.S. RankLocator offers one of the net's most profitable affiliate programs. Because every webmaster in the world could profit greatly from this tool, and this is the ONLY place it is available on the net, prepare for an explosion of money in your bank account in just the first few weeks of promoting it! Click here.